I have always been fascinated by Morocco …. so when I saw this book on the Kindle store, I was very keen to read it. Am so glad that I did. Its an interesting read and gives a great glimpse into life in the 1800’s for a woman in England and of course in Morocco. The storyline is very simple – Sibylla Spencer is a headstrong girl who feels stifled in London because women are just expected to marry and be a wife and mother. She gets married to Benjamin, a manager in her father’s company and is hoping that she will be free to be whatever she wished to be. At Sibylla’s prompting, her father selects Benjamin to fill a vacancy as the company’s agent in Mogador, Morocco, and she accompanies him there. Sibylla happily escapes to exotic Morocco. She assimilates into the Moroccan culture and society easily, by learning the language and spending time with the women folk. She has two children with Benjamin and raises her family in Mogador and also becomes a trader, something she couldn’t do in England. Benjamin in the meanwhile is more interested to make money and enters into shady deals, which gets him arrested ! Sibylla falls in love with the handsome French soldier André Rouston and it just feels right because of Benjamin’s behaviour. There is a lot of drama that unfolds as Benjamin returns from the dead and finally Sibylla and André are reunited during her daughter’s wedding. The daughter is André’s and not Benjamin’s. 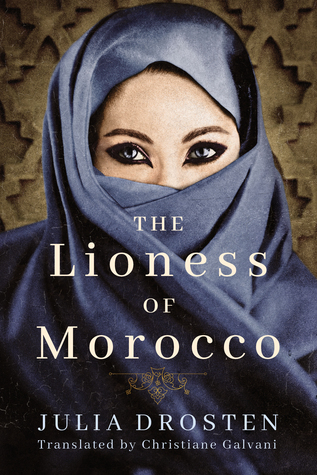 As I read the book I found a few references to India and was fascinated by many of the customs of the Berber tribe in Morocco which were so much more advanced and empowering to women. The storyline reminded me of Barbara Taylor Bradford’s “Woman of Substance” and Sibylla bears a resemblance to Emma Harte. “No one seemed to take into account her wishes, which were to experience life in all its richness and to see the world’s wonders with her own eyes.” and “She was well aware of the fact that an unmarried woman was treated the same as a child. Perhaps marriage was indeed the only way to win more freedom” – these statements that are Sibylla’s thoughts tell us exactly the kind of person she is :). “Sibylla asked her father to place her dowry in a trust. It was a rare occasion when she and he were of the same mind. A trust was the only way for a woman to retain the fortune she brought into her marriage. Otherwise, every penny went to the husband.” Interesting to see that women in England got dowries and they could choose to put it in a trust or the entire thing just went to the husband…. so how was that any different than the dowry system in India ? “According to Berber custom, widows and divorced women determined for themselves who their next husbands would be, and how long they would be permitted to stay, for divorces were as simple as marriages.” I don’t know if this is historically correct but if it is, a big hurray for women empowerment and in a Islamic country. And finally in the last few chapters this statement was worth its weight in gold – “Remember: the worst man is he who accepts no apology, forgives no sin, and excuses no mistake.” Well, it applies to men and women. I enjoyed reading the book. It was written originally in German and then was translated. Would definitely recommend reading it… leave the fluff aside, its a nice depiction of a world without electric lights and cellphones and TV. Your pooch, your poop !